Happy New Year from Richmond! Henry and Mom and I are visiting Kirsten and Marcos and Emma Rose and having a wonderful time. We’ve mostly been lazing around in pajamas all day, playing QuizUp, watching a bit of TV, listening to music, and playing with the baby, who is a dear darling adorable 6-month-old squeezable dumpling! I brought along wool to knit her a red-and-white striped cardigan and finished it today, but I have to take it home with me to install a zipper. Photo soon. Let’s hope 2014 is better than 2013! Today’s Google Doodle celebrates 100 years of crosswords! They put up an actual playable crossword. It’s a good one, too — it felt like a Monday-ish NY Times puzzle. That is to say, easy but not STUPID :) I solved it in 13:30. I’ll add a direct link to the crossword doodle when there is one (when it moves to their doodle archive). It’s almost Christmas! Time for my recording of “A Christmas Carol” by Charles Dickens. 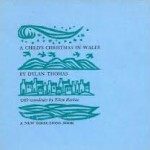 If you’ve never heard Dylan Thomas’s own reading of this, please seek it out. Mine is good, but his is, of course, perfect. Sorry, tired. (I write these Christmas entries the night before they post.) No description this time. It’s a good chapter, though! See yesterday’s blog post for info about this lovely book. Again, I’m dropping you into the middle of a great book. Here’s the “Christmas Eve” chapter from the fantabulous “The Dark is Rising” by Susan Cooper. 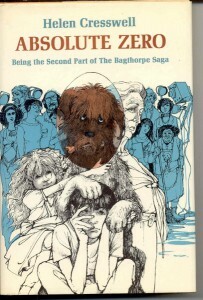 I re-read this book (or re-listen to my audio version) every year at Christmastime. Click the image to see the book on Amazon and buy your own copy. I’m serious. Do it. Today, something a little bit different. This is the last chapter (in three parts) of a hilarious book called “Absolute Zero”, about the eccentric Bagthorpe Family. I think it will be enjoyable even if you are unfamiliar with the book. Quick summary up to this point: the entire Bagthorpe Family has become obsessed with entering competitions. Their dog, Zero, has had the most success, becoming the nationally famous spokesdog for “Buried Bones” pet food. In addition, through big sister Tess’s clever manipulation of the truth, the family has been named “Happiest Family in England”; because of this, they’ve had a film crew in their house for weeks and their “Happy” Christmas celebration will be broadcast live on television. If you don’t want to hear The Grinch in German (see previous post) here is a little video, from a couple of years ago, of me reading it in English. I can’t find this book for sale anywhere, darn it. Well, read along with your English copy and you’ll learn a little bit of German, perhaps! Click the image to see the book on Amazon and buy your own copy! Christmas is almost here! Little Bear can smell it—and so can you! The air is filled with the aroma of gingerbread cookies, minty candy canes, the piney Christmas tree, and yummy hot apple pie. 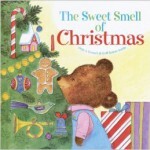 Celebrate the holiday season with this classic Golden storybook which includes six scratch-and-sniff scents. Ever get obsessed by a song suddenly and for no apparent reason? Today my Sudden Song Obsession was Dinah Washington singing “Ain’t Misbehavin’” (1947). I hooked up my laptop to the speakers and put the mp3 on repeat for a couple of hours and sang along. Not kidding. Sorry, neighbors. Another Melendy Christmas chapter for you! 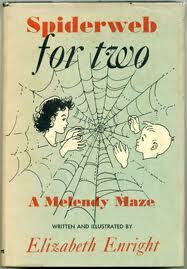 This time it’s a chapter from Spiderweb for Two, the last Melendy book. I’m in the middle of recording this book; I hope to finish in January if I can stop coughing! Randy and Oliver Melendy awake one fall morning full of gloom. Their brother and sister are away, the house seems forlorn and empty, and even Cuffy, their adored housekeeper, can’t pick up their spirits. Will they have to face a long and lonely winter? But a surprise message in the mailbox starts a trail of excitement and adventure that takes them through the cold season. When summer finally comes around again, the children have found fourteen messages in all, and the end of the search brings them a rich reward. Today in my Christmas Audiobook Extravaganza we have the Christmas chapter from a wonderful book called “The Four-Story Mistake”. If you like this chapter, you can find the rest of the audiobook on my “Kayray Reads to You” page. Into the Four-Story Mistake, an odd-looking house with a confused architectural history, move the Melendy family — Mona, Rush, Randy, Oliver, Father, and Cuffy, the housekeeper. Though disappointed about leaving their old brownstone in New York City, and apprehensive about living the country life, the four Melendy kids soon settle into this unusual new home. 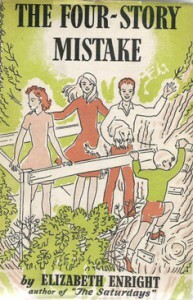 Here, they become absorbed in the adventures of the country, adjusting themselves with all their accustomed resourcefulness and discovering the many hidden attractions that the Four-Story Mistake has to offer. The Four-Story Mistake is the second installment of Enright’s Melendy Quartet, an engaging and warm series about the close-knit Melendy family and their surprising adventures.